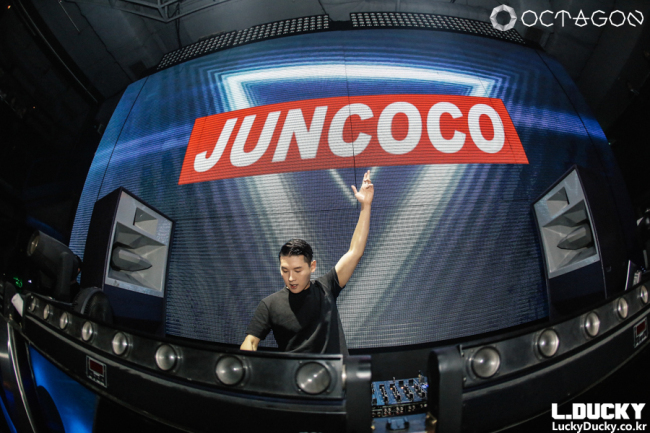 As the clock ticks past midnight in the crowd-packed clubs of Gangnam-gu DJ Juncoco, who draws enormous cheers from avid clubbers, is getting ready to step into the DJ booth. As one of the most in-demand DJs today, he is treated like a rock star at weekend club parties. The pulsating and sassy electro dance music he spins under the colorful LED lights doesn’t let clubbers slow down. His tunes, which show a touch of moody French style EDM and old-school pop melodies, compel the clubbers to jump even harder. 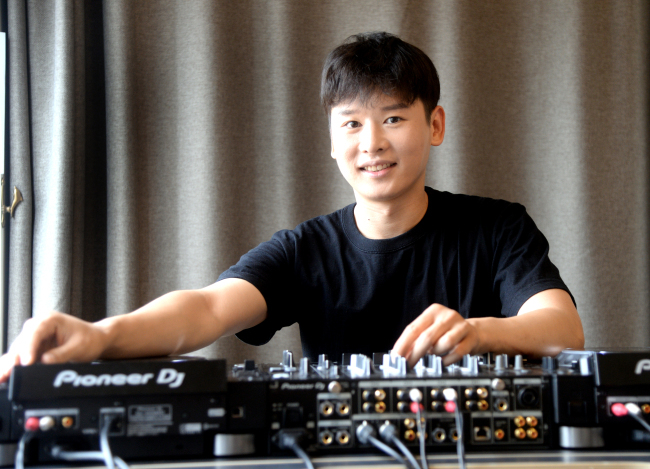 Being a DJ may appear glamorous and attractive to some, but the 28-year-old DJ, whose real name is Lee Joon-ho, believes Korean DJs should not neglect their duty as a trend setter and keep working on developing the local EDM scene. “I think one of the biggest troubles for Korean DJs is that they fall into fame too much. Just like K-pop stars, many local DJs try to look and behave like idol stars,” said Lee during a recent interview with The Korea Herald in Seoul. “I once appeared on a TV show that featured several local DJs, and I got a bit upset because the program staff wanted me to act like an idol star,” he added. Lee said being a DJ means being a trend setter who introduces new culture to people. And it requires constant researching and studying of new genres and styles of EDM, rather than rehashing the old tunes. “As those DJs feed on popularity, they become obsessed with pleasing the crowd’s ears with the same popular club tunes. When I first played Ed Sheeran’s ‘Shape of You’ in a club, people didn’t like the music, complaining that it was too dull. A few months later, every club in Seoul was playing that music,” Lee said. Lee, who first began spinning at a small lounge bar in Hongdae at the pinnacle of youth culture in 2008, confessed that there was a time he got so tired of the commercialized Korean club scene that seemed to have no respect for both DJs and their music. After seeing wealthy clubbers bossing around in the club and feeling that his music became a mere tool to lure clubbers, Lee flew to Los Angeles with the aim to focus solely on music. “I was about to move to LA, which was a ground for many international artists. But after visiting several famous clubs there, I realized that the clubs in the US were not that different from those in Korea,” Lee said. He added that he found out Seoul housed more clubbers who could enjoy his music. Lee returned to the club in Seoul he used to work in, but with a new hope this time: To lay the groundwork in the local EDM scene where DJs can pursue their own music and raise their status. While keeping his own music style, Lee is also seeking an opportunity to collaborate with K-pop artists, as he wants to present a new form of EDM. Korea has seen a growing number of EDM festivals recently, but most festival-goers are not even aware of the names of the local DJs performing in the festivals, said Lee. Calling it an abnormal phenomenon, Lee said local DJ’s also hold responsibility for failing to make their names more known to the public. “Many local DJs lack their own identities, which I think is a result of just pursuing popularity in clubs. It is one of the biggest barriers that are keeping them from taking a leap,” Lee said. “Local DJs should expand their horizon and compete with DJs around the world, not only with other Gangnam-based DJs,” he added. Labeling a world-famous Dutch EDM artist and producer Hardwell as his inspiration, Lee said he also hopes to become a DJ who can please the ears of people across nations with his self-produced tunes, and an artist who never gets lazy exploring the vast sea of music. 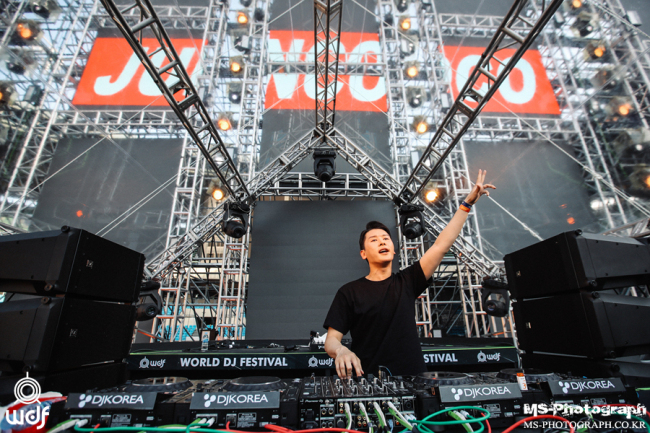 Aside from spinning at major clubs in Gangnam-gu and a number of music festivals at home and abroad, Lee performed at this year‘s World DJ Festival at Jamsil Olympic Stadium in Seoul in May.